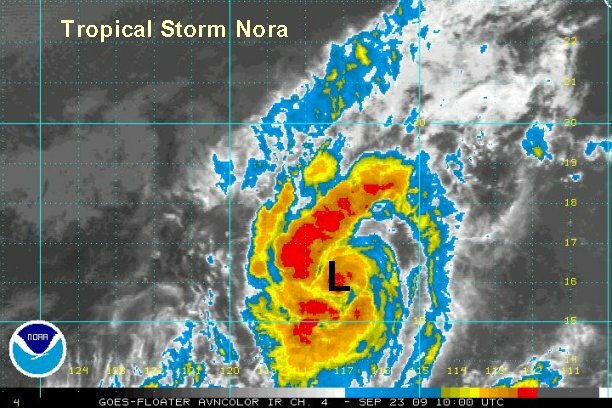 After following this tropical disturbance for several days, Nora quickly organized and became a tropical storm last night. 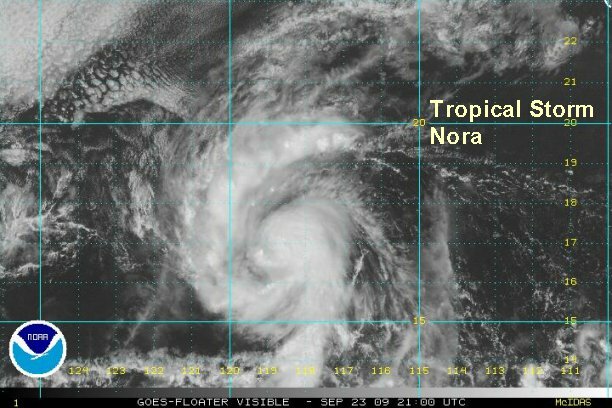 Nora went from an anomalous looking blob to nice looking banding features. We are looking for strengthing, possibly up to hurricane force before wind shear from the west increases in about a day in a half. As of 8:00 am edt / 5:00 am pdt tropical storm Nora was centered near 16.2° N / 117.5 W or about 675 miles southwest of Cabo San Lucas, Mexico. Top sustained winds are estimated at 45 mph (NHC 40 mph last advisory) and increasing. It is moving just north of due west about 10 mph. Banding continues to improve in structure today around Nora. Also, the CDO or cloud mass near the center of circulation is expanding. We still think that Nora has the chance of reaching near hurricane strength before shear weakens it in the next 24-36 hours. As of 6:00 pm edt / 3:00 pm pdt tropical storm Nora was centered near 16.8° N / 118.7 W or about 700 miles southwest of Cabo San Lucas, Mexico. Top sustained winds are estimated at 55 mph (NHC 50 mph last advisory) and increasing. It is moving just west northwest about 9 mph. Nora began weakening several hours ago as it appeared that some shear was starting to affect it. Cloud tops warmed and the strength dropped - probably down to about 45 mph. More recently, a new burst of deep convection is near the center of circulation and a new strengthening phase has begun. This burst will be short lived as wind shear increases again which is already visible on the satellite imagery. As of 7:00 am edt / 4:00 am pdt tropical storm Nora was centered near 17.2° N / 119.2 W or about 720 miles southwest of Cabo San Lucas, Mexico. Top sustained winds are estimated at 50 mph (NHC 50 mph last advisory). It is moving just west northwest about 5 mph. Tropical storm Nora is not a threat to Mexico. 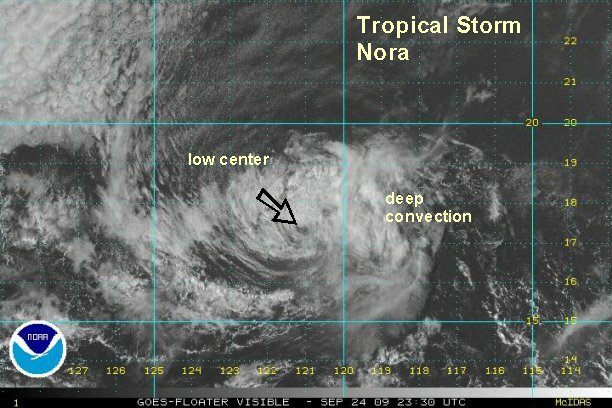 Upper air wind shear has stripped the deep convection away from the center of the circulation of Nora. The only deep convection is to the east and it's fading. We now think that Nora has dropped below tropical storm strength, with some wind gusts to 40 mph or a little stronger near the convection. As of 7:00 pm edt / 4:00 pm pdt tropical storm Nora was centered near 17.4° N / 121.3 W or about 820 miles west southwest of Cabo San Lucas, Mexico. Top sustained winds are estimated at 35 mph (NHC 45 mph last advisory). It is moving west at about 8 mph. 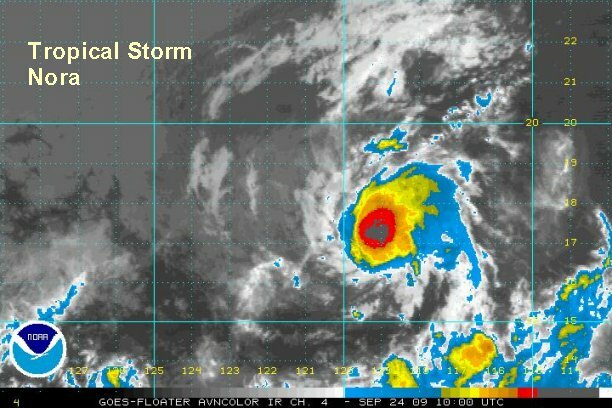 This will be our last update on Nora as it will continue to weaken and not affect any land mass.